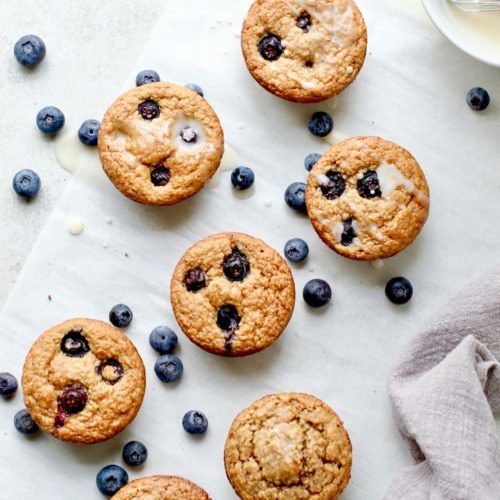 Made with whole grain oats, these healthy Blueberry Blender Muffins are lower in sugar and packed with fiber. They are perfect for your breakfast or brunch table! When I tested this recipe, I feared the muffins would turn out dense and heavy because they don’t have any wheat flour – which lends a light, airy texture to muffins. But nope. I’ve made these three times and each time – even with slightly different ingredients a couple times, they turned out perfectly moist and fluffy. Once upon a time, I told myself that I didn’t like muffins. Then I made these strawberry buttermilk ones and realized that I love muffins made with oats. You can use them as a quick breakfast on the go, a brunch sweet, or a healthy snack any time of day. 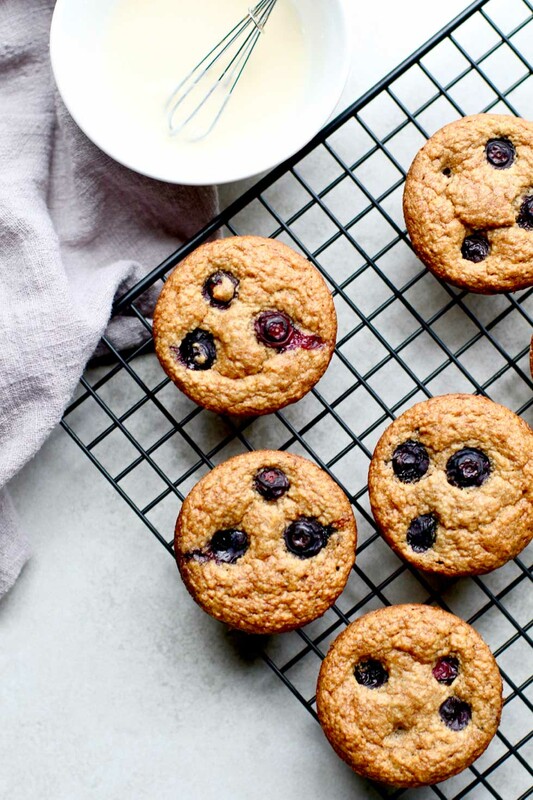 And these blender muffins couldn’t be easier to whip up. You will need a blender. I used regular old fashioned oats to make oat flour. It takes less than 30 seconds. I prefer this to buying oat flour, which is more expensive and one more thing to have to store in the pantry or fridge. 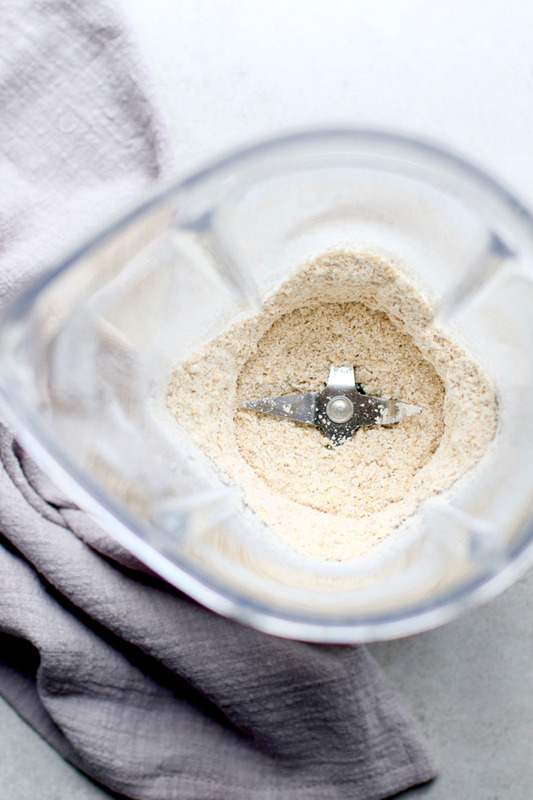 Once the flour is ready, you’ll add typical baking ingredients like baking soda and baking powder and even some granulated sugar. For the wet ingredients, I kept these muffins dairy-free by using avocado oil (other neutral oils work too) and plant-based milk. I tested the recipe using nut milk, pea protein milk, and oat milk and they all worked. In addition to using oat flour, using very ripe bananas is an essential part of this recipe. I’m talking skin completely brown level ripeness. The bananas add bulk and sweetness to the muffins. And a little secret? I accidentally left the sugar out of one batch when I was working on the recipe. They were still good! Admittedly, the muffins were not as sweet and they also didn’t rise as much but they were still tasty and I will probably make them without the sugar when the bananas are super ripe and I’m making them only for myself – or others without much of a sweet tooth like me. The muffins here are shown with an optional glaze which is a simple blend of sugar, vanilla extract, and water. So here’s the simple recipe. PIN it for later and be sure to tag me on Instagram when you make this recipe! 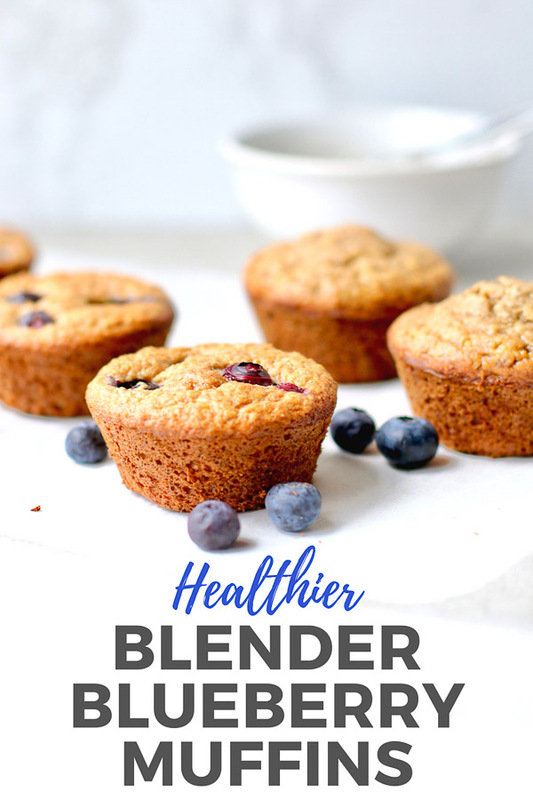 Naturally sweetened and made with whole grain oats, these healthy Blueberry Blender Muffins are lower in sugar and packed with fiber. They are perfect for your breakfast or brunch table! Preheat oven to 350F with the rack in the center position. Prep a muffin tin* with cooking spray or paper liners. Put the oats in a dry, clean blender. Pulse briefly to grind to a flour consistency. Combine the oat flour, baking soda, baking powder, salt, sugar, and cinnamon in a medium mixing bowl. Set aside. Add the milk, oil, egg, banana, and vanilla to the blender and puree until smooth. Add the wet mixture to the dry ingredients and mix until combined. Let sit 10 minutes to ensure the best rise. Fold in the blueberries (or add them on top of the batter once inside the muffin tin). Pour the batter into the wells of the muffin tin about ¾ full. Bake until lightly brown and a golden crust forms around the edges, 20-22 minutes in a standard muffin tin (about 12 minutes in a mini muffin tin). Allow the muffins to cool in the pan not longer than 5 minutes - just until you can touch them. 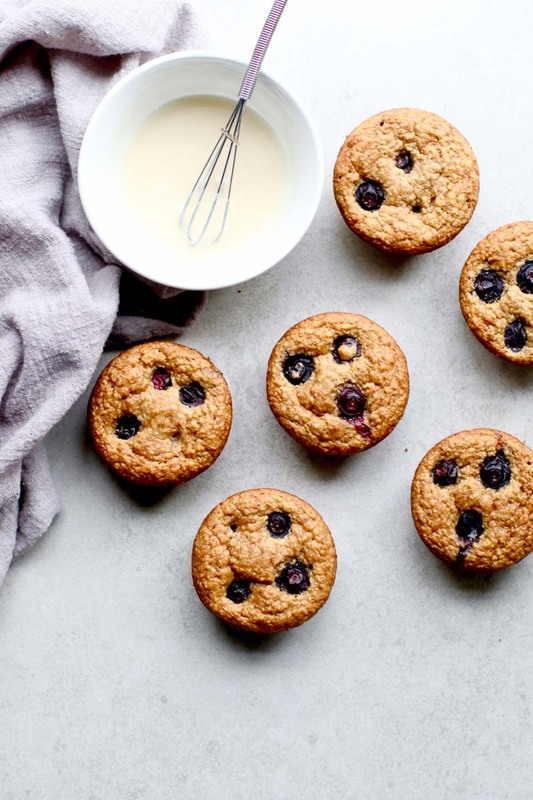 Remove muffins and allow to cool on a cooling rack. Serve warm if possible but room temperature is OK.
* Recipe makes about 8 standard muffins or 24 mini muffins. Prep the pan and adjust baking times accordingly. The muffins here are shown with an optional glaze which is a simple blend of sugar, vanilla extract, and water. Freezer Note: These muffins freeze well. Freeze the ones you won't eat in a couple days in a freezer safe bag or container for up to 3 months. When ready to enjoy, pop them into the toaster oven to reheat.